Round Annapurna trekking is one of the best and rewarding treks in Nepal. In round Annapurna trek, the trekkers have an opportunity to explore the wonderful views of the southern and northern Himalayas and the beautiful Nepali hills. Thorong-La Pass (5,415m) is the highest pass in this trekking. From Thorong-La Pass the trail goes all the way down to Muktinath, the important holy place for both Hindu and Buddhists. Close to Muktinath temple, the tourists can view eternal burning flame over the undergrounded water spring. Round Annapurna trek provides tourists with an opportunity to explore many different Nepali ethnic groups, their culture and traditions. Excursion day in Muktinath is fantastic to understand the ethnic people and their culture. Trekkers encounter red rhododendron forest fully bloomed in March to April. The landscape in this trek is amazing. Some parts of this trek grant you a dense forest. And another part comprises just the necked hills and snowcapped mountains. Tourists enjoy a bath in the natural hot water pond at Tatopani. The Poone hill at Ghorepani is a best place to view the amazing scenery of Annapurna and Dhoulagiri Himalayan ranges, both above 8,000m. Trees: There are many plants in round Annapurna trekking. Schima,chestnut,hemlock,silver fir,rhododendrons and many small plants. The schima and chestnut are the major species of trees. Nepali language schima is called chilanune (itchy) it belongs to tea family. The chestnut that belongs to the family of oak or beech. The evergreen oaks are found at the height of from 1,700m to 3000m. There are more than 30 species of rhododendron called as "Lali Gurans" in Nepali language. The lower land of the trekking trail is covered by the beautiful rhododendron flowers. The hills are just colourful in Spring when the rhododendron trees bloom. Birds: There are many small birds around round Annapurna trek, including white capped river chat,whistling thrush,large pied kingfisher,white breasted kingfisher, Eurasian kingfisher, Himalayan griffon and lamer geier. 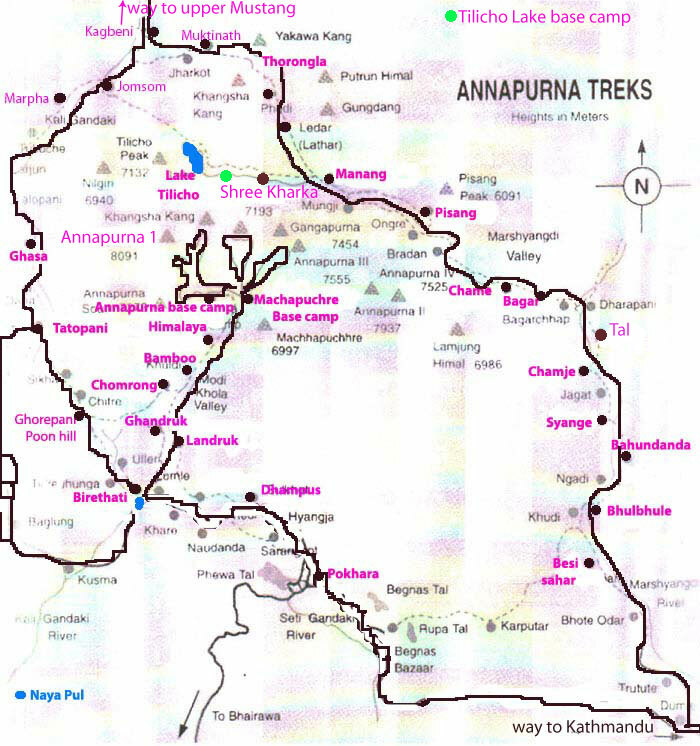 Wild animals: There are more than 100 wild animals found in Annapurna round trek. Among them, trekkers could view monkeys and common langur. Blue sheep are more common and the trekkers could see them in between Manang and Thorongla Pass. Leopards and bears are also found in this area. Cost: USD 1320.00 for one person. Cost: USD 1150.00 per person(This cost is valid for minimum 2 person). USD 890.00 for one person. USD 699.00 per person (This cost is valid for minimum 2 person). Day 11: Trek to Jomsom(2,800m) via kagbeni. Day 12: Drive from Jomsom to Pokhara. Day 13: Rest in Pokhara. Note: We can offer you a tailor made package, if this package doesn't meet your requirement. If you have short time, you can fly from Jomsom to Pokhara and can make more shorter. Domesdtic and International air ticket, airport tax and Nepal visa fees. All kinds of foods, drink during trekking and travel stay with us. Travel insurance and the cost of medical services of tourists. All kinds of cloth and personal trekking equipment. Other personal expenses and tips. Charted helicopter, plane and other transports in case of emergency.